Vegetable content equates to 40% carrots. A world premiere from our Nordic kitchen. Loads of vegetables in the pastadough and the pasta still tastes like fresh pasta. Suitable for vegetarians.Pastella Vegetable Pasta is a completely new type of fresh pasta with loads of vegetables in the pastadough. The vegetable content equates to 40%. 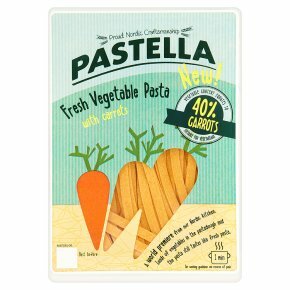 You might say Pastella Vegetable Pasta is vegetables disguised as pasta as the pasta still tastes and looks like fresh pasta. Bring 1 L of water to the boil (per 250 g). Add 1 teaspoon salt (if required). Boil the fresh vegetable pasta for one minute without the lid. Ensure all the pasta is under the water during boiling time. Hint: Place the cooked pasta on a dish, add approx. 0.1 L of the cooking water and serve vegetable pasta as part of your favourite dishes.The boiling time is 1 minute and starts from the moment the water (containing pasta) starts boiling.